“The Salem Witchcraft Trials of 1692” lecture at the Bridgewater Public Library presented by Historian and Professor Gary Hylander on October 4th at 6:30 p.m.
“An army of devils,” warned Reverend Cotton Mather, was on its way to afflict the men and women of the Massachusetts Bay Colony for their sinfulness and wicked ways. New Englanders believed in the “Old Deluder” and the malevolent powers of his “Invisible World”. When rumors of Tituba’s conjuring of spirits in the household of Reverend Parrish surfaced, powerful witchcraft hysteria seized Salem Village and neighboring towns. 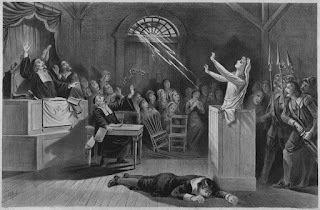 By the time the Salem witchcraft trials were suspended, nineteen of the accused, mostly women, had been hanged for the crime of witchcraft. Come listen to this most complex time in our history so that we may understand the issues of that era with heightened awareness compared to modern day “witch hunting”.